The European Tripartite Group, (ESA – EC – EUROCONTROL) has implemented, via the EGNOS project, the European contribution to the first generation of Global Navigation Satellite System (GNSS-1). The European Space Agency (ESA) has been in charge of the system design, development and qualification of an Advanced Operational Capability (AOC) of the EGNOS system (also known as EGNOS V1). In summer 2005, EGNOS has reached two major program milestones through the formal technical qualification process (known as ORR, Operational Readiness Review) and the start of its initial operations. These two events mark a successful completion of more than 8 years of intensive work by ESA and European industry. We refer to these, in general, as the Communication Function of EGNOS. Of these, this paper will focus mainly on the first two. The ESA ALIVE concept, (Alert interface via EGNOS) is concerned with the provision of early warning messages to citizens or governmental/local authorities in the event of a major event or disaster. The authors consider the ESA ALIVE a meaningful and viable concept, which may be implemented in a reasonable short time frame, contributing to save lives in the event of disasters. Disaster prevention and mitigation is a subject to which currently intensive attention is devoted. One of the main goals is to identify ways to inform people at risk, for instance, through natural events such as earthquakes, tsunamis, hurricanes, storm surges, extreme precipitation and flooding, or volcanic eruptions, so that specific actions can be taken to mitigate the impact of the disaster and ultimately, to save lives. Moreover, the same information channels would be valuable tools to support rescue and aid operations in the aftermath of disasters thus reducing the total loss of human lives. This discussion is motivated by the obvious principle that disaster prevention, mitigation and preparedness are better than mere disaster response. The ALIVE concept is concerned with the provision of early warning messages to citizens or governmental/local authorities in case of a major event or disaster. Early warning. The provision of timely and effective information, through identified institutions, that allows individuals exposed to a hazard to take action to avoid or reduce their risk and prepare for effective response. Early warning systems include a chain of concerns, namely: understanding and mapping the hazard; monitoring and forecasting impending events; processing and disseminating understandable warnings to political authorities and the population, and undertaking appropriate and timely actions in response to the warnings. Those most affected by disasters are often the poor and the socially disadvantaged in developing countries as they are the least equipped to cope with the situation. In large regions of the Earth, loss of life and capital caused by disasters is increased by the lack of sufficient communication infrastructure for warning, preparation and rescue. For instance, in African countries and the Indian Ocean, where the lack of communication is a severe limitation for efficient warning systems, additional communication paired with a positioning service could be of great help. Disasters generated by dynamic processes in the Earth, including, for instance; earthquakes, tsunamis or volcanic eruptions. Disasters generated by dynamic processes on the Earth’s surface, including, for instance, land slides, rock avalanches, subsidence and collapses. Disasters generated by meteorological or hydrological phenomena, including, for instance, storm surges, inundation, extreme frost and snowfall, storms, hailstorms, tornadoes, hurricanes, and wild fires. Disasters of Biological nature also exist such as plagues or epidemics. Finally, disasters of Technological nature encompass fire, explosions, chemical substance spills, environmental contamination, wars, subversion, and terrorism. The available observation and sensing elements for each kind of disaster, principally focusing on existing professional world-wide networks. The kind of information that, derived from observation and information systems, can be timely provided to end users to avoid personal damage and save lives. The added value of the position information. The associated information mission requirements (necessary bandwidth; time to send; acknowledgement mechanisms; format; etc.). The potential recipients of the messages. Other available communication information means. Broadcast this information through SBAS systems, via Geostationary satellites, with a global coverage. In the case of EGNOS, this information can also be broadcast through other means thanks to the EDAS (EGNOS Data Access System) dissemination system. In this section we briefly provide some information on the current estimated available BW for additional EGNOS messages. This analysis is based on the RTCA DO229C MOPS standards , which define the minimum update rate that needs to be respected by EGNOS to comply with the safety of life requirements. Table 1 lists all current EGNOS broadcast messages and the minimum necessary BW to comply with the International Standards. 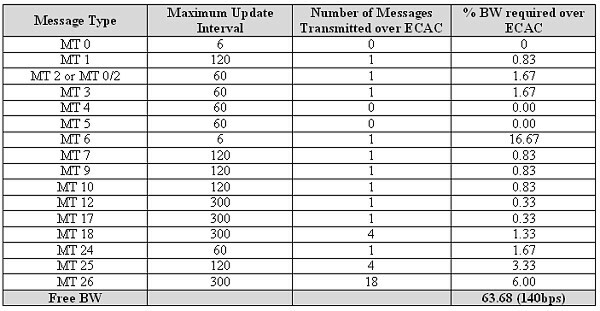 In this table, we have assumed that MT0 (which is today sent every 6 seconds) is removed (as it will be the case when transmitting Safety of Life messages early in 2007) or combined with MT2 –MT0/2 (as planned to be implemented early 2006). This analysis reveals that assuming GPS safety of life transmission the BW available for additional messages will be of the order of 35% of the total BW, i.e. equivalent to 75 bps. 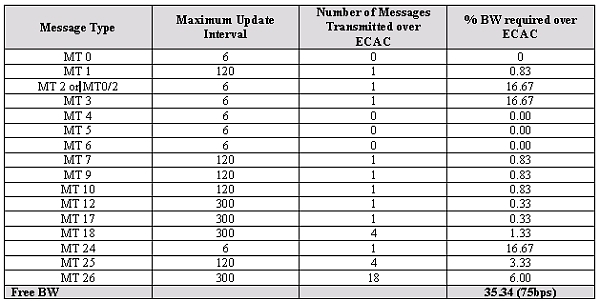 Since the transmission of EGNOS messages is made in block messages of 250 bits, this opens up for the transmission of about 1 message, of 250 bits per second, each 3–4 seconds. Part of this extra BW could well be used to provide the EGNOS communication messages like the information on disaster management through the ALIVE interface. In a dedicated study of the Search & Rescue return link possible emergency services, a preliminary mission analysis based on Galileo revealed that the bandwidth required to fulfill the mission requirements was 3.33% (7bps) i.e. an EGNOS message is sent every 30 seconds (thus only consuming about 1/10 of the total available extra BW). The ALIVE mission, being a service of similar nature, is believed (though this needs to be confirmed by the relevant disaster management experts) to require a bandwidth in the same order of magnitude. Therefore, the ALIVE mission is considered to be fully compatible with EGNOS existing margins. Moreover, the excess bandwidth can be used for other EGNOS message broadcasting services, such as for EGNOS extensions, or other communications functions or specific information to aviation users on interferences (RFI) or similar. It is also worth to note that the available EGNOS BW may still be higher, if the fact that the GPS Selective Availability (SA) has been removed in May 2000 is taken into account. Indeed, actual DO229C standards do allow the relaxation of the update of the fast clock corrections from the 6 seconds to be used in the case of SA activated (which is the current adopted baseline in EGNOS) to up to 60 seconds when SA is off (which is the current situation). Table 2 shows the equivalent available extra BW for EGNOS for the case of SA off, which reaches a value of 63% (equivalent to 140 bps). Thus, approximately one extra EGNOS message of 250 bps could be sent every 2 seconds for extra services, such as SAR return link and ALIVE. This is believed to be a very comfortable BW for these kinds of services. The broadcast of these communication messages is based on the more general concept of using the available EGNOS BW to broadcast spatially related information from an originator to EGNOS users through dedicated SBAS messages. Fig. 1 indicates the architectural implementation of such communication function embedded within the EGNOS system. Independently from the application considered, the information to transfer to EGNOS users is made available to the EGNOS computing platform (CPF) through links and pre-processing stages. This information is then broadcast as an SBAS message. Users having the possibility to process these specific messages can then extract the enclosed information and use it in the way they need. 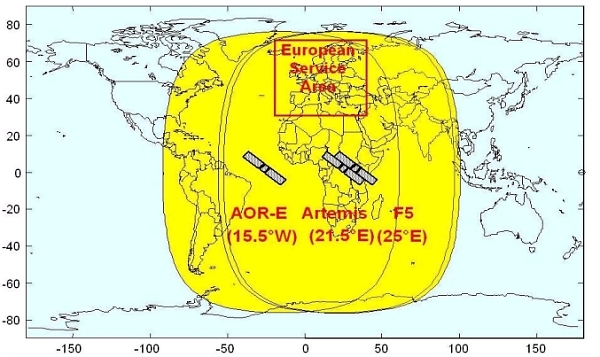 The added value of this process is the opportunity to provide reliable information to users equipped with an EGNOS terminal within the entire EGNOS geostationary coverage as indicated in Fig. 2. Safety critical information (event, recommended action) is typically associated to spatial information (location). This will be of particular importance for the functions of SAR and ALIVE. National and international organisations in charge of disaster management or for the provision of civil protection services make use of infrastructures for monitoring, communication and control. Here we denote such infrastructures as Disaster Management Centres. The architectural implementation of the ALIVE concept on the basis of the EGNOS system is illustrated in Fig. 3. Disaster Management Centres have the task to collect and generate relevant information (e.g. : event, location, status, action) required to fulfill all the missions for which they have been designed. 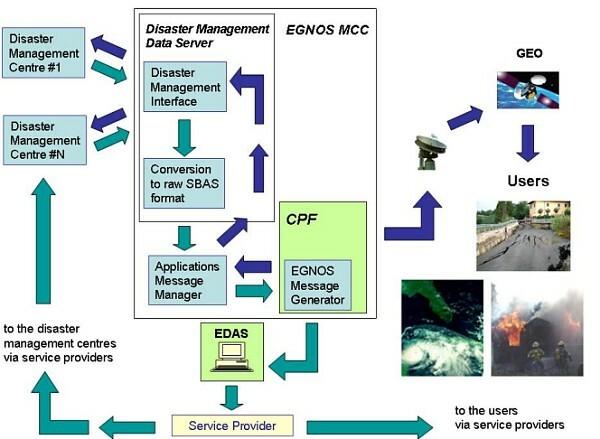 The information generated by Disaster Management Centres is sent to a dedicated Disaster Management Data Server (Specific Application Data Server) within the EGNOS MCC, which converts this information into raw SBAS format and forwards it to the Applications Message Manager. Disaster Management Centres receive through the Disaster Management Data Server the acknowledgement that the information has been sent with the typical EGNOS guarantee of service. To return the acknowledgement to the Disaster Management Data Server that the message has been sent. The EGNOS computing platform (CPF) rearranges the broadcast sequence of the SBAS messages according to the input provided by the Applications Message Manager. The analysis of the preliminary mission requirements of ALIVE revealed that there is no problem to allocate additional SBAS messages among the broadcast of EGNOS current messages. Once the broadcast sequence is ready, the message (or messages) containing the information generated by the Disaster Management Centres, is included in the EGNOS up-link and down-link loop in the same way as other messages. Any user (within the EGNOS satellites footprint) equipped with an EGNOS receiver capable of processing these additional messages is made aware of the problem, location, status and action. Again, the EGNOS link loop guarantees the delivery of the information to enabled users. The provision of messages through SBAS is considered by the authors as a very adequate solution for disaster management and SAR return link missions. The SBAS systems (EGNOS, for the case of Europe) have a number of inherent characteristics, which make the SBAS solution very attractive in both these cases. This is explained and justified in this Section from different perspectives. There are currently three SBAS systems available, which will all provide service from 2006 (since 2003 for the case of WAAS): In Europe the EGNOS System developed by the European Space Agency in tri-partite with the European Commission and Eurocontrol, in the United States of America, the WAAS (Wide Are Augmentation System) developed by the Federal Aviation Administration and in Japan the Multi-function Transport Satellite (MTSAT) Augmentation System or MSAS. Other regions are also interested in providing SBAS services although their plans are less advanced than those in Europe, the US and Japan (e.g. India’s SBAS, GAGAN, GPS and GEO Augmented Navigation). The three existing systems (EGNOS, WAAS and MSAS) provide service with a global worldwide coverage, thanks to their complementary SBAS GEO broadcast area footprints. This is illustrated in Fig. 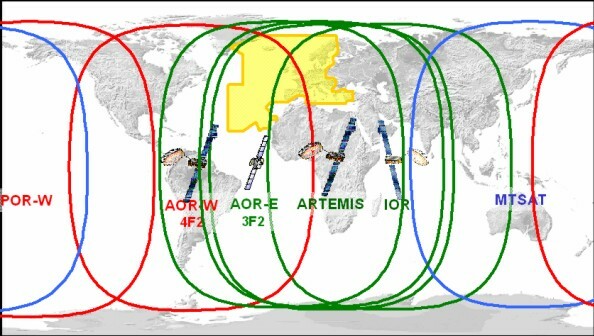 4, where the existing EGNOS, WAAS and MSAS GEO Broadcast areas are just illustrated (note that SBAS L1 broadcast is done through a global GEO beam). The resulting coverage on the Earth is therefore complete with the only exception of the poles. Consequently, when working together, the SBAS systems are a viable way of broadcasting disaster alert/mitigation, SAR Return Link or other similar messages worldwide, for users using the same frequency and signal standards, and therefore fully compatible receivers. Another interesting feature of the SBAS provision for alert management is that in addition to the global coverage provided, the SBAS receiver (needed to demodulate the SBAS disaster alert message) also provides, through their embedded GPS receiver, precise position information. In this way, while a message is sent globally, only those receivers concerned will be activated (e.g. to take a given action or be prepared for rescue). Knowing then the area of the possible disaster location or the beacon ID of the SAR Beacon, the intended users could be warned. Other receivers, providing a position outside the disaster area or with a different beacon ID, would instead be transparent to the call and will not be activated. A possible conception (for the sake of illustration) of the SBAS Alert prevention message is illustrated in Fig 5. It is to be noted that nowadays, there are a large number of GPS/SBAS receivers available on the market. Indeed, basically, because of the similarity between GPS and the SBAS-GPS-like send signals, almost all developed GPS receivers are also made SBAS compatible receivers. Therefore, the reception worldwide of the SBAS alert message could be easily implemented. Either because of poor terrestrial communication infrastructure of the disaster area (which unfortunately is often the case) or because the disaster itself provokes a collapse of the land-based communications, it is of high interest in those cases to have a guaranteed back-up communication link. Satellite communication is the most natural back-up transmission means in those cases. SBAS communication provides a potential satellite communication link, available all the time on the disaster area, irrespectively of the situation of the ground infrastructure. Furthermore, it is to be noted that the most extended worldwide “satellite communication receiver” is the GPS/SBAS receiver, in the sense of a device which is able to receive specific communication data via satellite. No other satellite communication mean is so widely extended. It is also important to note that all the SBAS receivers follow the same international standards, and therefore any SBAS receiver works anywhere in the world in the SBAS coverage area. If a new SBAS message for disaster prevention/mitigation or SAR return link is conceived, this may well be standardised worldwide. This is considered an important feature allowing a global worldwide standardised SBAS alert prevention system and a SBAS SAR return link system. EGNOS has built-in mechanism that guarantees that a message has been sent with the adequate content and on the appropriate time. This information may also be provided back to the alarm or rescue centre interfacing with SBAS. SBAS have built-in mechanism to make sure that a message went out in good conditions with no errors. For the case of EGNOS, the implementation of these interfaces is very well suited to the existing EGNOS architecture. This is believed to be true also for the other SBAS but is unknown to the authors. In the case of EGNOS, the system upgrade to provide the anticipated facility could be done in a short time frame, with low risk and with a simple approach, provided adequate political and institutional support is given. It is believed that this function could be readily available in EGNOS in a timeframe of 2 years after program approval. The SBAS systems have all been developed and will all be operated under institutional control. In the case of EGNOS, the system is currently owned by the European Space Agency member states, and ownership is planned to be transferred to the Galileo Supervisory Authority, a European Institutional Organisation in charge of EGNOS operations and exploitation. WAAS and MSAS are also under institutional control through their respective Governmental Departments for transportation. For the mission intended, having institutional control is considered a key feature since it guarantees service provision, no service interruption, and system necessary future upgrades. A system such as this must implement measures to mitigate the affects of any spoofing attacks and mitigate the affects of Denial of Service attacks. Examples include "flooding" an alert network, so preventing legitimate network traffic and so disrupting the entire broadcast service or preventing a particular individual from accessing the service, such an attempt could arise, for example, in the case that a terrorist group tried to amplify the affects of an attack designed to cause mass casualties by preventing dissemination of timely alerts. SBAS is not immune to such attacks but its institutional control and operational concept makes it far more resilient to such scenarios than other alternative forms of alert, typically those in broadcast media. Current SBAS systems have been conceived for a typical operation lifetime of 15 years (i.e. for a time frame around 2020). In addition, there are plans to further modernize SBAS systems and to adapt them to GPS and Galileo modernization plans. EGNOS is currently integrated in the GALILEO overall strategy, and therefore the complement to this SBAS function through Galileo will also be smoothed and will ensure further long-term duration. This long-term issue is considered a very important feature of the SBAS system, which ensures continuity of the proposed ESA ALIVE system. Disaster prevention, mitigation and preparedness are better than disaster response. The possibility to use Satellite Based Augmentation Systems (SBAS) message broadcast capability as a means for disaster announcements has been discussed in this paper. Specifically, the implementation of a dedicated interface in EGNOS for disaster alert messages (ALIVE: Alert Interface Via EGNOS for disaster prevention/mitigation) and for the Search & Rescue (SAR) return link messages has been proposed. 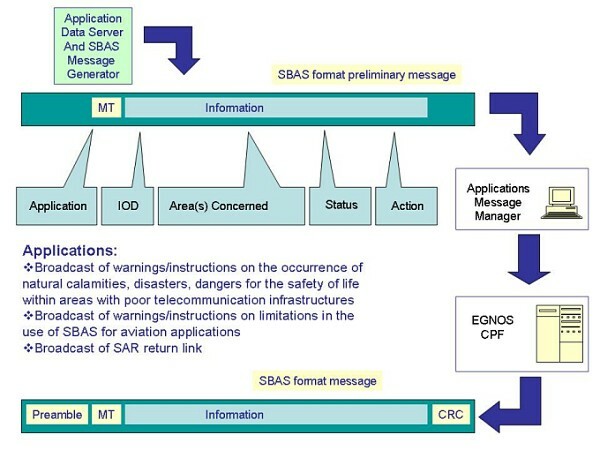 As explained through this paper, the SBAS systems (such as EGNOS) have a number of inherent characteristics which make the SBAS solution very attractive, including the possibility of global coverage, provision of a combined warning and positioning system, availability of a large number of worldwide common receiver with common standards, SBAS built-in features that guarantee adequate message broadcast (e.g. integrity of message, confirmation of transmission), and the fact that SBAS are operated with safety of life guarantees and under institutional governmental control. This paper provides a preliminary analysis of the mission concept, the interest of a possible SBAS solution for these communication functions, as well as an outline of the potential architectural concept; and a possible implementation path strategy. There are many alternative communications channels through which disaster alerts messages may be broadcast. These include traditional public address systems, broadcast/media/internet and commercial services such as satellite communications or SMS. SBAS cannot possibly provide a single universal solution for the broadcast of alert messages since the environment and circumstances of each disaster can vary considerably in terms of location, urgency and recipients. This paper does however clearly demonstrate many advantages over alternative channels and significant merit to the inclusion of SBAS in this mix of systems. The authors consider the ESA ALIVE proposal as meaningful and viable concept, which may be implemented in a reasonable short time frame, contributing to save lives in the event of disasters. 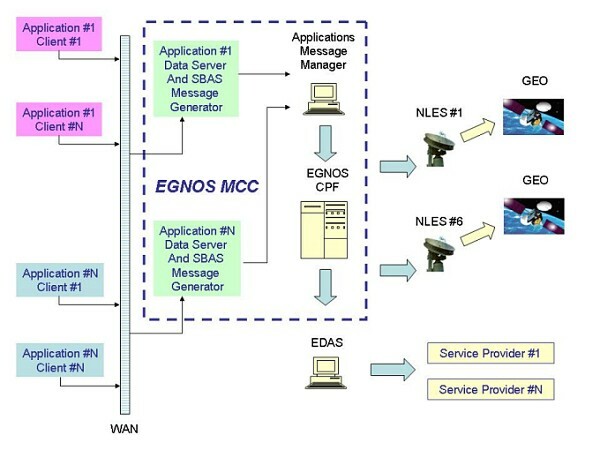 J.Ventura–Traveset et al, “The EGNOS ALIVE Interface (Alert Interface via EGNOS) for disaster prevention and mitigation”, ESA Technical Note, April 2005. J.Ventura–Traveset et al, “EGNOS Status, Performances & Planned Evolutions (2006–2010)”, Proc. of the European Navigation Conference GNSS 2005, July 2005. “Introduction to the COSPAS-SARSAT system”, C/S G.003, Issue 5, Rev.1, Oct. 1999. Minimum Operational Performance Standards (MOPS) for Global Positioning System/Wide Area Augmentation System Airborne Equipment, Nov. 2001.